Summary: Josette Price sees her future in Beddingfield Park. While her brother, George, needlessly pursues a naval career, Josette promises to watch over their beloved parents and the Beddingfield Park estate. Nothing would make Josette happier than to see her sister and her self settled within the palings of Beddingfield. But dark, brooding Captain Carter rides into their lives with news that ruins everything: George has been lost at sea. Learning the Park is entailed to their cousin, Edward, Josette must decide between marrying her fickle relation or helping her besotted sister trap him in her stead. Before a decision can be made, will Captain Carter and his delightfully spinsterish relatives stop the Price girls from making a choice that would be the greatest tragedy of all? 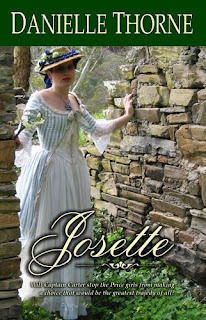 If you are a fan of Jane Austen and Regency Romance you will be smitten by Josette. The tension between the characters and fast paced plot made it an outstanding pick. A cross between Pride and Prejudice and Sense and Sensibility, it captures two sisters in the season of their most important decisions. 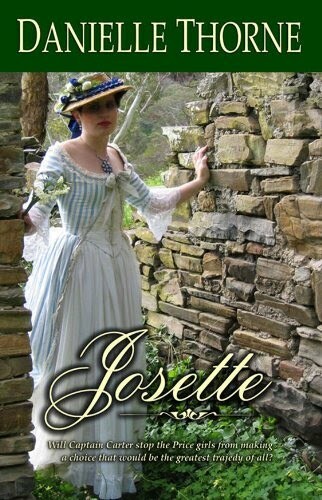 Sprinkled with deception, intrigue, and slow building romance, Josette is all you could ask for and more. I would recommend it with our highest rating to all readers as the best Regency romance I’ve read yet. To enter to win your own copy courtesy of author, Danielle Thorne fill out this form. Be sure to read Danielle’s guest post below! Fire and Ice would like to welcome author Danielle Thorne to our site. She has written a wonderful post called ” Why Imperfect is Perfect” plus she’s donated a copy of her most recent book Josette as a giveaway. About her: Danielle Thorne is the author of Historical and Contemporary romance with such titles as THE PRIVATEER, TURTLE SOUP, and BY HEART AND COMPASS. Other work has appeared with Espresso Fiction, Every Day Fiction, Arts and Prose Magazine, Mississippi Crow, The Nantahala Review, StorySouth, Bookideas, The Mid-West Review, and more. She won an Honorable Mention in Writer’s Digest’s 2006 annual writing competition and the 2008 Awe-Struck Short Novel Contest. Danielle writes from south of Atlanta, Georgia. She was the 2009-2010 co-chair for the New Voices Competition for young writers, is active with online author groups such as Classic Romance Revival and moderates for The Sweetest Romance Authors at the Coffee Time Romance forum boards. She lives with four sons and her husband, who is an air traffic controller. Together they enjoy travel and the outdoors, High School marching band music competition and BSA Scouting. Most people don’t enjoy blemishes. We throw away moldy bread, agonize over pimples and rub those little smears on the mirror. Why then, do we prefer our heroes with a few defects? This isn’t a new idea. Jane Austen created one of the most memorable and complicated heroes in 1813 when she penned PRIDE AND PREJUDICE. Our first few encounters with Fitzwilliam Darcy do not fare well in the opening pages. How could anyone fall for such a rude snob? But in a matter of chapters and exchanges of the heart, it isn’t just Elizabeth Bennet who falls for the gentleman. Readers do, too. Most of us started out with Prince Charming, while toddling around in our mother’s heels, but by the time reality sank its teeth into our innocent little hearts, things were changing. Suddenly there was the “bad boy.” He was the cute but always-in-trouble boy on the playground with the cool tee-shirt and sweaty hair. You know the one…he yanked your ponytail hard enough to make you cry and lured you under the monkey bars for a sloppy first kiss. We all ran from boys like that. But it was kind of fun. Nobody wants to reach for something they don’t believe they can ever have and let’s face it–none of us are the perfect size with perfect features. Our scars from reality’s bite marks make it hard for us to buy that some perfect hero is going to sweep us off our feet and love us for eternity. And if it can’t happen for us, we have a hard time buying it can happen for a heroine, even one that we love. We need a hero with a few flaws. Whether they are physical, emotional, or just a personality quirk, flaws make our heroes more human. They give us something to forgive. (So we can forgive ourselves?) And don’t forget, there’s also the flattering idea that a woman can make a man love hard enough to actually change! The perfect hero is imperfect. We love him despite his flaws. He loves us back, and he changes for the better. I believe this principle gives us hope, not just for our heroine’s Happily Ever After, but for our own. There are still a few good gentlemen out there. I should know, I married one! A good romance story can be so much more than a Cinderella story. It can make us believe that despite all our blemishes we can be loved; and despite his, he’s still the next best thing to Mr. Darcy! Find out a little more about my moody hero in JOSETTE. Inspired by Jane Austen’s work, it’s my interpretation of romance in the Regency era of elegance and manners. Josette Price sees her future in Beddingfield Park. While her brother, George, needlessly pursues a naval career, she promises to watch over their beloved parents and the park estate. Nothing would make Josette happier than to see her sister and her self settled within the palings of Beddingfield. But dark, brooding Captain Carter rides into their lives with news that ruins everything: George has been lost at sea. Learning the Park is entailed to their cousin, Edward, Josette must decide between marrying her fickle relation or helping her besotted sister trap him in her stead. Only Captain Carter and his delightfully spinsterish relatives can stop the Price girls from making a choice that would be the greatest tragedy of all.